After alternating between the first and second set, Ghost stays in the first set for two consecutive shows. The first Ghost opener since Shoreline. I have included the quasi-segue into Wilson. I am going to make this clear right away. This Ghost is ultra patient, it locks down on a funk groove and never lets go. If you love patient jamming this Ghost is for you. A solid start to this version and a great tempo set by Fish. This is right in the wheelhouse of my ideal intro to Ghost. Very smooth and funky, Gordon seems to have some extra stank through the composed section as well. The pace lends itself to Page and Mike getting extra funky during the solo section. This version has a long pause, and a decent drop in, not too bad. The Jam gets funky right away. Fish is laying down a slow pace which creates a ton of space for the rest of the band. If I had to say which band member was leading I would say Mike, but not by a lot. Everyone is hanging back and things are extremely patient, during this laid back groove. Really the first noise from Trey comes in at 3:37, when he lets out a couple of loops that echo over the crowd. At about the 4:05 mark, after one of Trey’s loops, Gordon picks it up. He gets into a super crazy tone (almost talk box sounding) and things get really funky! When Mike hits that tone, Trey starts to dig into some funk licks. The sound coming from Mike is easily one of my favorite sounds in his arsenal. I almost feel that at times I am listening to Peter Frampton. Trey’s loops are also firing over all over the place. It doesn’t get much more patient than this jam. Everyone is holding their own and really getting down to the groove. The beauty of a jam like this, is that when it is this patient, you can hear every note from every band member so clearly. At 6:18 our Ghost is joined by some outer space aliens. Crazy sounds added to this deep grove. Fishman drives right through and doesn’t miss a beat. After a Fishman fill at 6:52 Trey starts building the jam very slowly. Fishman is still driving the same funk beat while Trey builds. This jam is hypnotic and I can zone out for minutes. 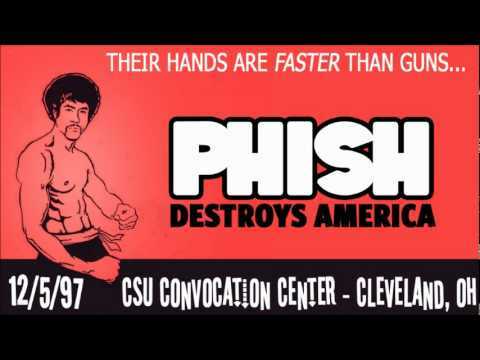 My mind drifts to things that I have never intended to think about during a Phish jam. I give Trey high marks during this section. He is adding life to the jam, yet completely within the space he is given. Trey is just one of four band members during this jam. His part is no more important than the others. I talk about balance during jams, and this section certainly has it. You can tell every member is locked into what everyone else is doing. Every note seems to flow as a direct reaction to what someone else is doing. At about 8:05 after one of Trey’s loops dies the crowd shows its appreciation. Page seems to take this to heart and really starts to bring it on the piano. Trey also rips into a couple of power chords, followed by Mike getting much louder as well. Fish meanwhile, is just locked onto this beat. From 8:00-9:25 it certainly seems like the jam is going to peak into a massive explosion. Instead, they drop it back down again and almost start the build over. I would say Trey leads through this hypnotic section. He is playing beautifully, while everyone meshes around him. The pace that Fish has set, and held, is the key to this melodic jam. At about 9:45, after Trey plays a couple of extended notes, Page really finds himself. Another great example of why I am such a Page McConnell fan. Every time he plays a long note and space is created, Page plays seems to choose the perfect chord. When I listen to other bands, Page is usually the person I miss the most. When he finds a spot like he does from 9:45-12:10, there are few sounds on this Earth I enjoy more. The interplay between the band is simply gorgeous. Every time Trey plays an extended note, Page fills it in. As Page lays it low, Trey picks up his soloing. If Trey climbs and starts to play more notes, Fish picks it up. Mike is all over the place and provides everything else that is needed. At 12:18 Trey repeats a series of notes and builds up some tension. At 12:23 he releases and the crowd goes nuts. Trey and Fish have really picked this jam up and it looks like a full blown peak might be coming. Instead, by about the 13 minute mark the jam almost fades back into the melodic grove from the previous section. Some noodling begins and the jam could go in any direction. 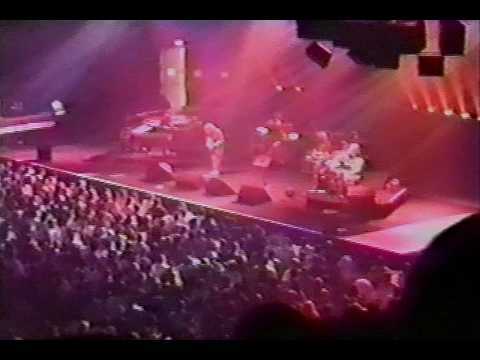 At 13:45 Trey plays a crazy space sound within the noodling. The jam sounds like it might go into a space peak, but instead it comes back down to Earth. The Jam just kind of hangs around, and could have went a number of different directions. At 15:45 the jam breaks all the way down into a Ghost outro. It fades very slowly into a pool of nothing. At 16:20, the Evil King Wilson finds this land of nothing and the crowd loves it. A rocker like Wilson is a great choice after such a hypnotic Ghost. Another extremely difficult Ghost for me to rate. I really like the full makeup of this Ghost. It is unbelievably patient and there is some fantastic interplay that takes place. Similar to many others, this version never hits the point where you loose your complete sanity. 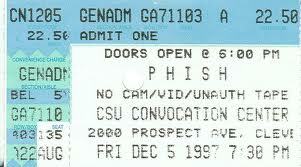 On the flip side, this Ghost is a fantastic example of the things that make Phish so great. This one is patient, balanced, and has the ability to make 16 minutes feel like much less. This was my first show, making this Ghost the first song I heard Phish play live. Hooked right off the bat.